An estimated 243,000 Hispanics of Argentinean origin resided in the United States in 2013, according to a Pew Research Center analysis of the Census Bureau’s American Community Survey. Argentineans in this statistical profile are people who self-identified as Hispanics of Argentinean origin; this means either they themselves are Argentinean immigrants or they trace their family ancestry to Argentina. Immigration status. About six-in-ten Argentineans (61%) in the United States are foreign born, compared with 35% of Hispanics and 13% of the U.S. population overall. About four-in-ten immigrants from Argentina (41%) have been in the U.S. for over 20 years. About half of Argentinean immigrants (49%) are U.S. citizens. Language. Three-quarters of Argentineans ages 5 and older speak English proficiently.2 The other 25% of Argentineans report speaking English less than very well, compared with 32% of all Hispanics. In addition, 77% of Argentinean ages 5 and older speak Spanish at home. Age. Argentineans have the same median age as the U.S. population but are older than Hispanics overall. The median age of Argentineans is 37; the median ages of the U.S. population and all Hispanics are 37 and 28, respectively. Among Argentineans, the median age of immigrants is 45 years, while it’s only 19 years among the U.S. born. Marital status. Argentineans ages 18 and older are more likely to be married (58%) than Hispanics overall (46%) and the U.S. population overall (50%). Among Argentineans ages 18 and older, those who are foreign born are more likely to be married than U.S.-born Argentineans—65% vs. 38%. Fertility. Some 7% of Argentinean women ages 15 to 44 gave birth in the 12 months prior to this survey. That was the same as the rate for all Hispanic women and similar to the overall rate for U.S. women (6%). Regional dispersion. Argentineans are concentrated in the South (38%), mostly in Florida (21%), and in the West (29%), mostly in California (20%). An additional 25% live in the Northeast. Educational attainment. Argentineans have higher levels of education than the U.S. Hispanic population and the U.S. population overall. About four-in-ten (41%) Argentineans ages 25 and older—compared with 14% of all U.S. Hispanics and 30% among the U.S. population—have obtained at least a bachelor’s degree. Among Argentineans ages 25 and older, the U.S. born have a higher college completion rate than foreign-born Argentineans—52% versus 38%. Income. The median annual personal earnings for Argentineans ages 16 and older was $31,000 in the year prior to the survey—greater than the median earnings for all U.S. Hispanics ($21,900) and similar to the median earnings for the U.S. population ($30,000). Poverty status. The share of Argentineans who live in poverty, 11%, is lower than the rate for the general U.S. population (16%) and for Hispanics overall (25%). Homeownership. The rate of Argentinean homeownership (58%) is higher than the rate for all Hispanics (45%) but lower than the 64% rate for the U.S. population as a whole. 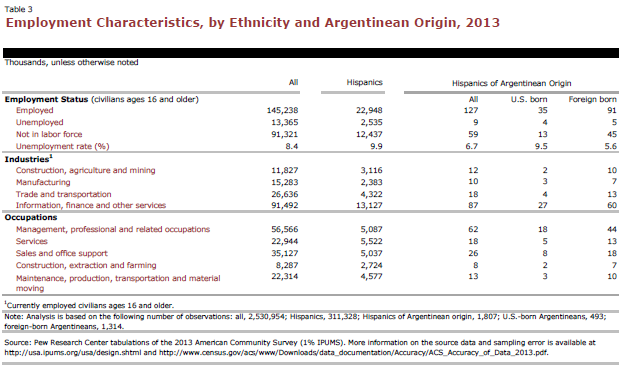 This statistical profile of Hispanics of Argentinean origin is based on the Census Bureau’s 2013 American Community Survey (ACS). The ACS is the largest household survey in the United States, with a sample of about 3 million addresses. 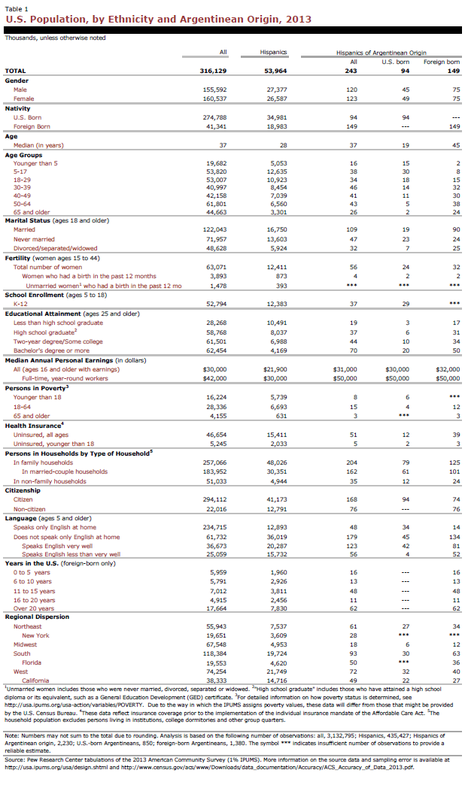 The data used for this statistical profile come from 2013 ACS Integrated Public Use Microdata Series (IPUMS), representing a 1% sample of the U.S. population.